A 5-2 win over the Rangers Saturday snapped the Wild’s three-game losing streak and banked it two much-needed points, but it came at a price. After the game, coach Bruce Boudreau said a lot of players had bumps and bruises and on Sunday ahead of hosting the Islanders at Xcel Energy Center, the team recalled forward Matt Read on an emergency basis, a source said. The Wild did not hold a morning skate Sunday, so it’s unclear who may not be able to play. “I expect everybody to be sore,” Boudreau said Saturday night. After a listless 4-1 loss to the Dallas Stars Thursday, the Wild skated much more urgently against the Rangers – getting into a battle that brought out a complete effort. Eleven different players tallied at least a point, the team had 75 shot attempts and it blocked a season-high 26 shots. It looked like a template that could work for the team during its remaining 10 games as it tries to climb back into a playoff spot. A win combined with a Coyotes overtime loss moved the Wild within two points of the second and final wild card seed in the Western Conference. Sustaining that level of intensity seems vital but also challenging, especially considering the toll it took on players. 6-5-2: Wild’s record in the second half of a back-to-back. 6: Game-winning goals for center Eric Staal. 49: Points for Staal in 51 career games vs. the Islanders. 10: Points for winger Jason Zucker in his last 11 games. 6-4: Record for the Wild vs. the Islanders in their last 10 matchups. New York is second in the Metropolitan Division, just two points shy of Washington for the top spot. The Islanders were in Detroit on Saturday and fell 2-1 to the Red Wings. It was their second loss in their last six games. Captain Anders Lee has a team-high 26 goals and has scored in three straight games. 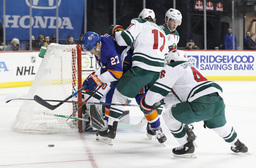 Eden Prairie native Nick Leddy has 13 points in 24 career games vs. the Wild.